Originally published under the title "The 3-Way Option." Foreign Affairs magazine has published a major statement from Israel's former minister of defense Moshe Ya'alon, a likely future candidate for prime minister, on his view how to end the Israeli-Palestinian conflict, titled "How to Build Middle East Peace: Why Bottom-Up Is Better Than Top-Down" (Jan.-Feb. 2017). Ya'alon offers an impressive analysis of why decades of diplomacy failed and its enduring stagnation. His "bottom-up" solution contains four elements, three of which are somewhat antique bromides and one of which is an exciting, untried idea – the three-way option that I will dwell on below. "the promotion of Palestinian economic growth and infrastructure development"
"improve Palestinian governance, anticorruption efforts, and institution building in general"
"a regional initiative that would bring in Arab states interested in helping to manage and eventually solve the Israeli-Palestinian conflict - whether or not those states have formal relations with Israel"
Shimon Peres' "new Middle East" did not quite pan out. 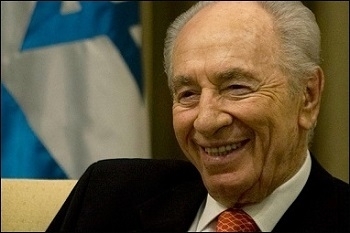 Shimon Peres in 1993 published The New Middle East, his lovely vision of a prosperous Palestinian population that's a good neighbor for Israel. Trouble is, both then and now his hopes have been shattered by Palestinian rejectionism, incitement, and death cultism. Surely, no one still seriously believes in 2017 that enrichment will moderate Palestinians. George W. Bush focused on improved governance in 2002 but fifteen years later things are more wretched than ever, what with anarchy, corruption, and violent feuding. Worse, the historical record strongly suggests that good governance would just lead to a more efficient Palestinian machine for attacking Israel. Security cooperation is an area – virtually the only one – where Israel and the Palestinian Authority work together: basically, the Israel Defense Forces protect the PA and the PA helps the IDF stave off attacks. However mutually useful, this collaboration has shown zero potential to expand to resolve their larger conflict. In contrast, the fourth proposal, bringing in the Arab states, is an important initiative that has yet seriously to be attempted; here, Ya'alon's plan holds out real hope. Israel wants from the Arab states, Turkey and Iran what Palestinians want from Israel – recognition and legitimacy. That's because a remarkable symmetry exists between what Palestinians want from Israel and what Israel wants from the Arab states plus Turkey and Iran, namely recognition and legitimacy. Noting this parallel, I have proposed in the Wall Street Journal that both aspirations be addressed in tandem, linking "concessions to Israel by the Arab states with Israeli concessions to the Palestinians." 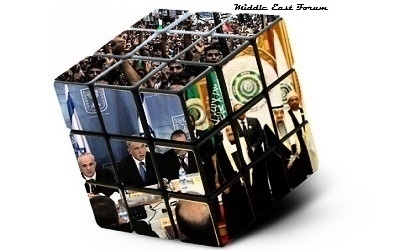 Everyone thereby gains: "The Arab states achieve what they say is their main goal, justice for the Palestinians. Israel gets peace. Palestinians have their state." For example, if the Saudis end their economic boycott of Israel, Israelis increase Palestinian access to international markets. If the Egyptians warm up relations, Palestinians have more access to the Israeli labor market. When the major Arab states sign peace treaties with the Jewish state of Israel, the Palestinians get their state. The Obama administration made a short but intense feint in this direction in 2009 but the Saudis turned it down and it sputtered to a close. Egypt's President Sisi raised the idea again in 2016, again without consequence. In short, the three-way option between the Arab states, Israel, and the Palestinians has not yet been pursued in a serious or sustained way. Shaken by U.S. cooperation with Tehran, Arab states may now be willing to work with Israel. With Sisi and Ya'alon now on record favoring the three-way option, and with Arab states shaken awake by the Obama administration's bizarre cooperation with Tehran, Middle Eastern leaders may be willing to work with the Jewish state in ways they were not ready for in 1990 or 2009. It's certainly worth a try by the incoming Trump administration. Progress in Arab-Israeli diplomacy will not come from retreading the defunct ideas of Peres or GWB; nor can security cooperation possibly lead to political breakthroughs. My first preference remains U.S. support for an Israeli victory; but if that is too much for now, then involving the Arab states at least offers a way out of the stale, isolated, and even counterproductive sequence of Israeli-Palestinian negotiations.